WORLD WAR II -- (25) A lot of 25 issues (HALF of the 50 issue lot shown) each with front page war headlines. 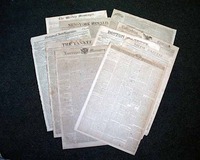 Folio-size; nice for resale or for someone wishing to begin a collection. 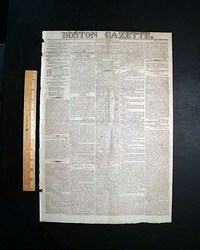 The issues may have edge tears and/or a rough left spine, but they are nice for framing and do not have loss of text. 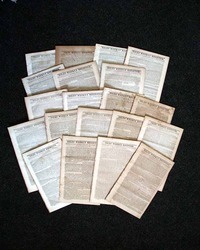 SCIENTIFIC AMERICAN, New York A lot of 25 issues dating from 1881 thru 1906. 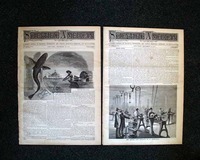 Many photos and illustrations of the latest inventions and scientific improvements and gimmicks of the era. 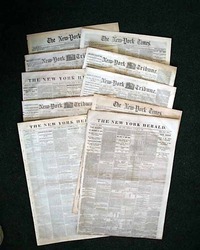 All are complete issues in nice condition. 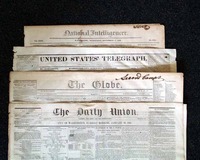 WHOLESALE VARIETY LOT of 100 American newspapers dating from 1820 - 1896 all in average or better condition--not a damaged lot--with at least 10 different titles. A great lot for a dealer or anyone wishing to begin a collection. An incredible value at under $2 per issue. If purchasing folders, we recommend purchasing at least 20 for this lot. 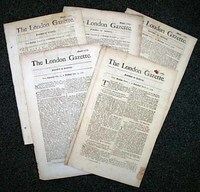 THE LONDON GAZETTE A lot of five issues of the world's oldest continually published English language newspaper, all from the early 1700's (1712-1729), priced at a bargain due to being a blend of 2nd rate and slightly damaged issues. 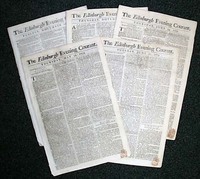 A great opportunity for authentic issues from the early 18th century at a fraction of their typical cost. 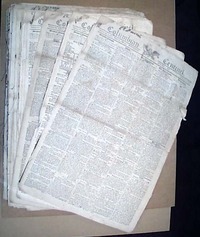 RENO EVENING GAZETTE, Nevada, early 1880's. 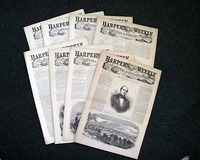 A lot of five issues, all are complete and are in very nice condition. Great to have from this well-known town from the "Old West". 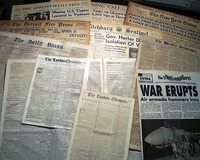 WORLD WAR II -- A lot of 50 issues each with front page war headlines. 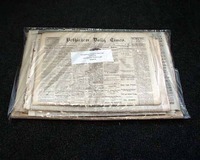 Folio-size; nice for resale or for someone wishing to begin a collection. 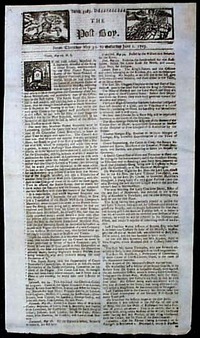 The issues may have edge tears and/or a rough left spine, but they are nice for framing and do not have loss of text. 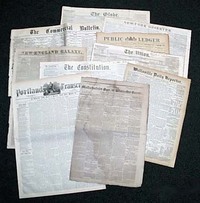 THE FLORIDIAN, Tallahassee, Florida, 1840's A lot of five issues from just after Florida’s statehood. 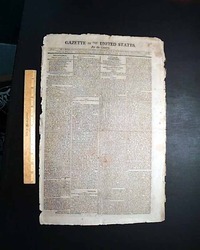 All are in “2nd rate” condition (staining, rubbing, close-trimming, etc. 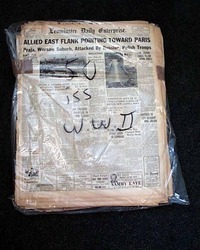 ), but are not damaged. A very popular lot. 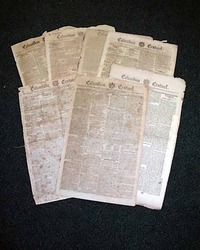 Issues from early Florida are very difficult to find and are quite collectible. A great set at a bargain price. 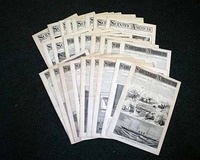 (10) SCIENTIFIC AMERICAN SUPPLEMENT, New York A lot of ten issues from 1900 - 1915. 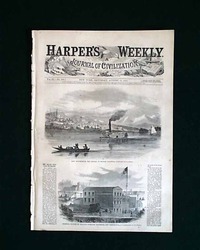 Not a "supplement" of the regular issue, but rather a separate stand-alone title which got its start to report on the Centennial Exposition in Philadelphia. Nice condition with a wealth of illustrations and photos throughout. 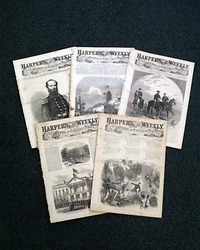 EARLY YEARS OF HARPER'S WEEKLY: Lot of 8 issues of this famous title from 1857-1859, all different dates from its first three years. Nice condition & with some illustrations. A nice wholesale lot at a good price.